*Present address: Centre for Ion Beam Applications, Department of Physics, Faculty of Science, Block S12, 2 Science Drive 3, National University of Singapore, Singapore 117542. E-mail: physvr@nus.edu.sg. 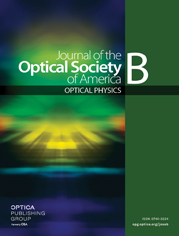 We have investigated nonlinear absorption of Rhodamine B dye in methanol and water near resonance (532 nm) on the higher-energy (435 nm) and lower-energy (600 nm) sides of the absorption band, using an open-aperture Z-scan technique with nanosecond pulses. We observed reverse saturable absorption (RSA) at 435 nm in both of the solvents, and a transition from saturable absorption (SA) to RSA with an increase in either intensity or concentration at 600 nm in methanol. A transition from RSA to SA with an increase in concentration at 600 nm was observed with water as the solvent. We used theoretical analysis based on rate equations to determine the two-photon and excited-state absorption coefficients from the experimental results. a For concentrations <2.6×10-3M, no nonlinear absorption was observed.